Moose (Alces alces) are the world's largest member of the deer family, and the Alaskan moose (Alces alces gigas) is the largest of all moose (males weigh 1,000 - 1,600 pounds). 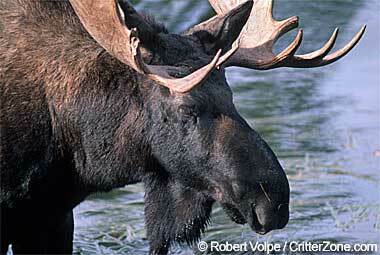 Moose mostly inhabit northern forests of North America, Europe, and Russia (in Europe they are called "elk"). 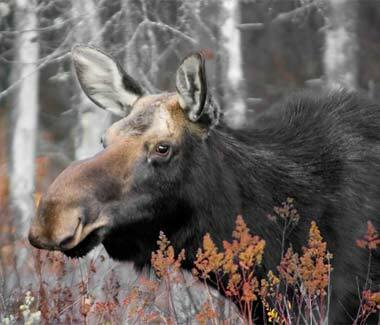 Alaskans often find moose in their yards in the winter. 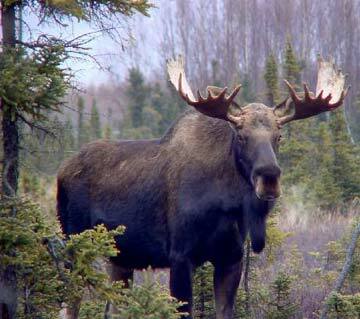 Other conflicts between man and moose include moose eating crops, standing on airfields, and wandering city streets. Historically, moose were an important source of food, clothing, and implements to native Americans living along Alaska's major rivers. Magnificent bull moose: photo © Doug Lloyd (used by permission). with attribution / no derivative works).